Artist, Sarah Merideth, works in textiles: dyeing, quilting, and embellishing fabrics. She prefers to work with silks and rayon, which yield beautiful colors and have a soft sheen. She has a BA in Art from Truman State University, with a focus in Fibers. Since then, she has been exploring new techniques and hopes that more art lovers will begin to recognize that Textiles is not just quilting or a craft anymore. Fabric can be manipulated much in the same way as paint, metal, clay, and wood: you can work two dimensional or three dimensional, you can build on it, you can change its appearance. It is what you make of it, as are so many things in this life. More of Sarah's work can be seen on her website. 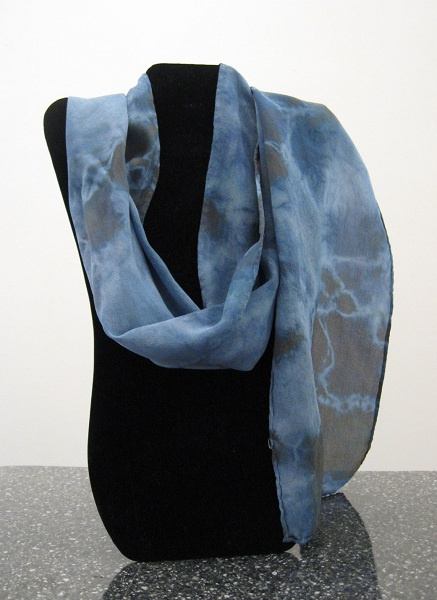 Visit the Gallery the see a variety of designs of hand-dyed silk scarves by Sarah. Currently her selection of scarves range from a variety of silks in two lengths, an open weave cotton, as well as rayon circular scarves. 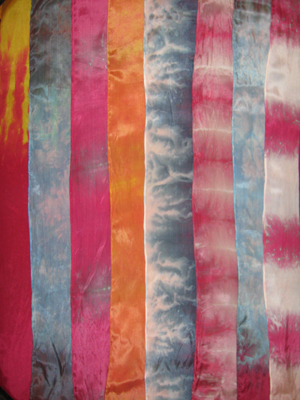 All scarves are hand dyed and some are either marbled, discharged, or printed using her original designs.